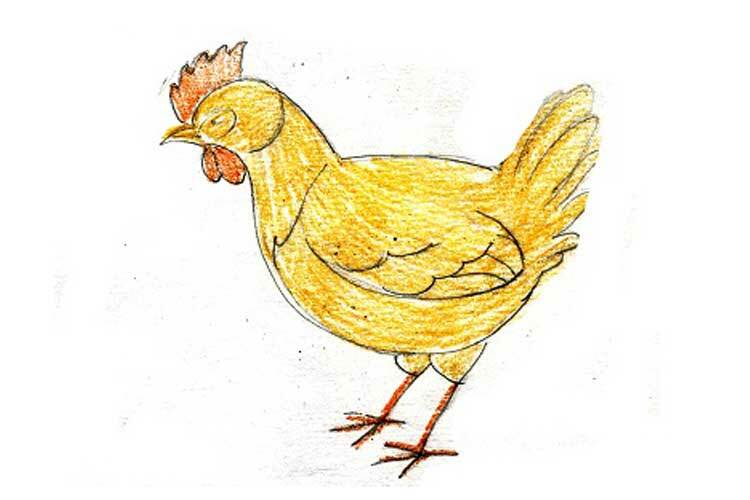 As of 2011, there were on 19 billion chickens increase during every nation on the globe.In this article, we will examine three examples that demonstrate how to draw a chicken. Therefore, sit back in front of the table, sharpen your pencils and we will start learning! It is no shock, then, that such a well-recognized animal would mark in our art and activity. 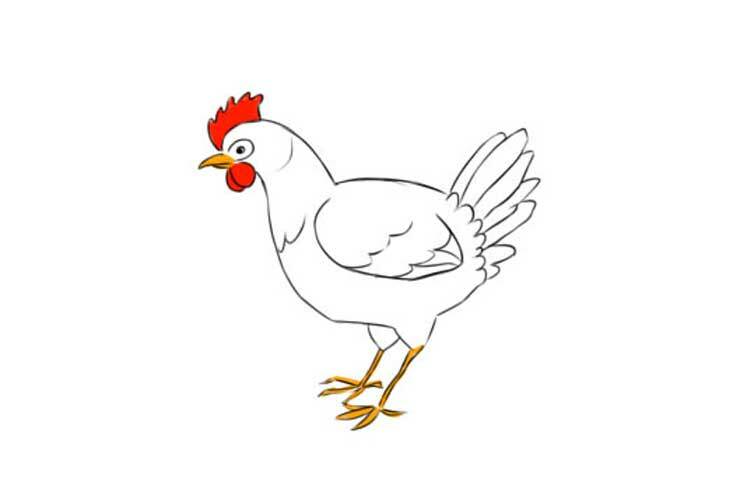 Chickens have enjoyed starring roles in such energetic movies as Chicken Little (2005), and Chicken Run (2000). 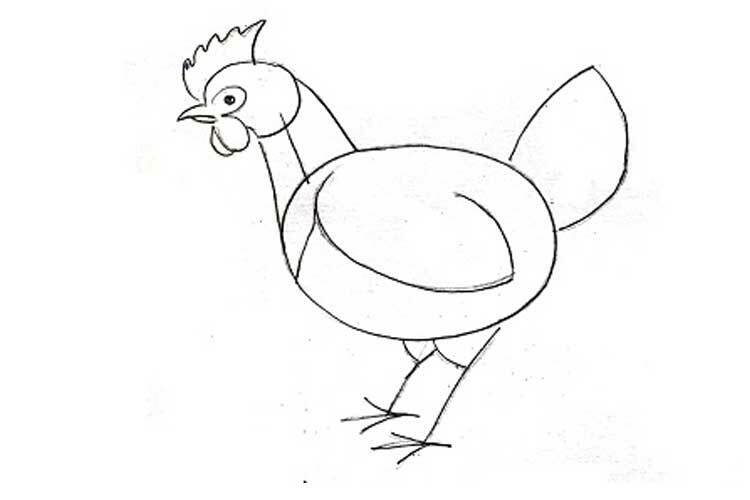 To draw a chicken, we need paper and a pencil, it is also a good idea to have some eraser in stock. 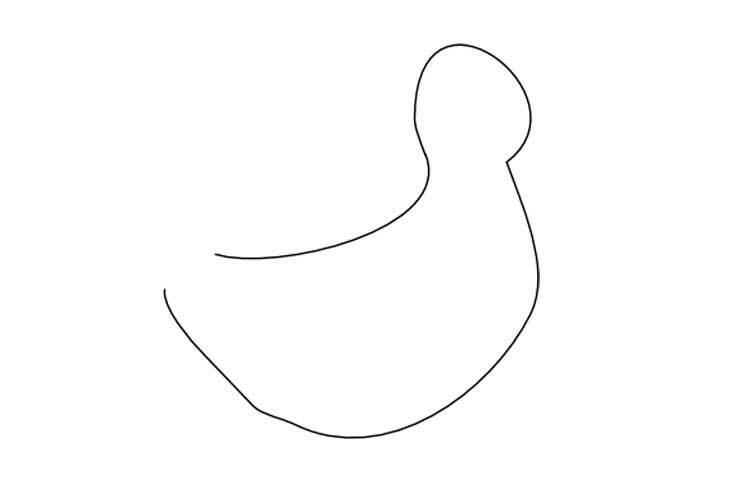 Draw two ovals like this; this will be our body and chicken’s head in the future. 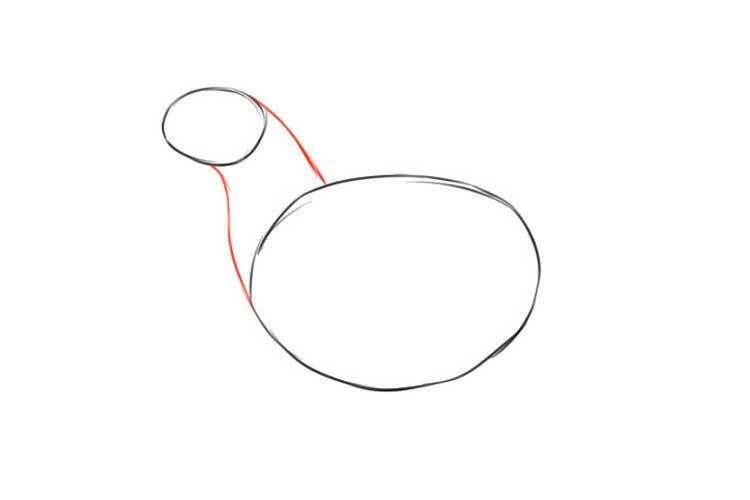 Now you need to connect these two ovals in this way using simple lines; we are already beginning to get the body of the bird. 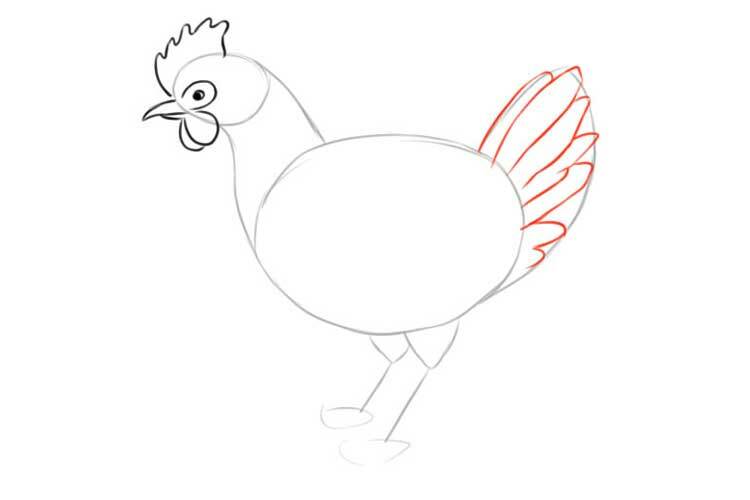 To draw a chicken, you need to add more details – on the right we draw just such a shape for the base of the tail, and from the bottom – the support for the chicken legs. Next, make an easy sketch of the paws themselves. 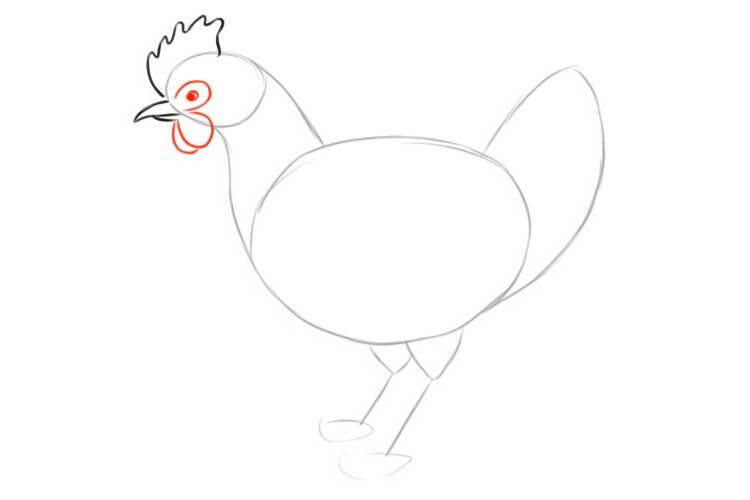 Our base is ready; now, focusing on the lines and proportions, we begin to draw the chicken itself. I start with the head – here we will need to portray the beak and the comb. 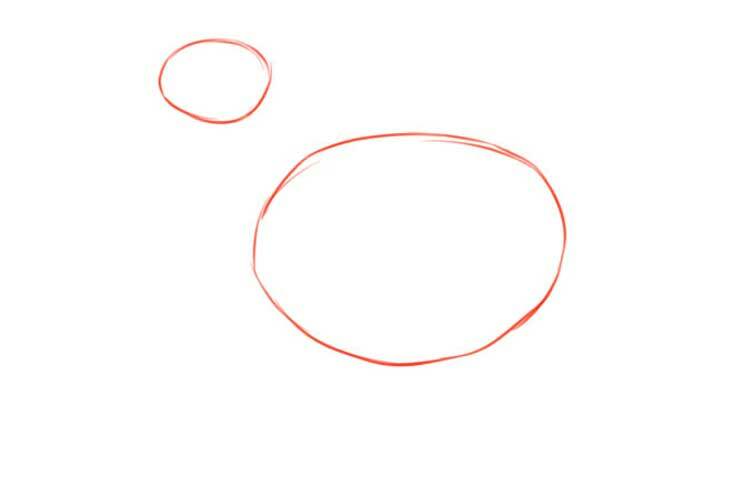 These lines should already be fatter, but we recommend that you first draw quickly, and only then circle. 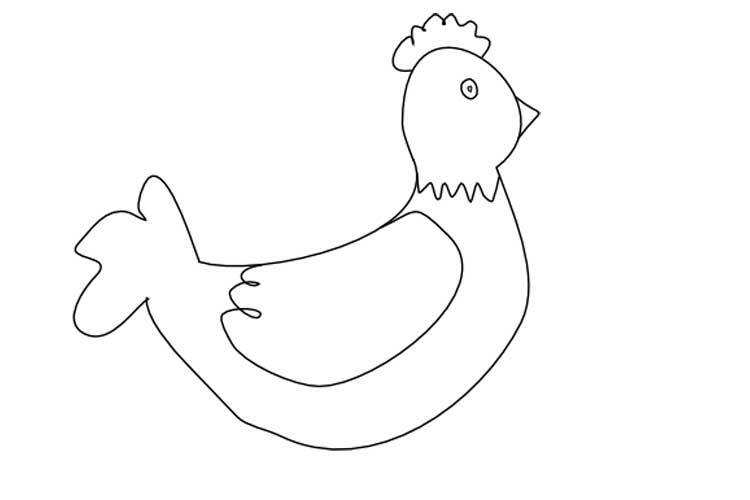 Now we need to draw some more details on the chicken head. 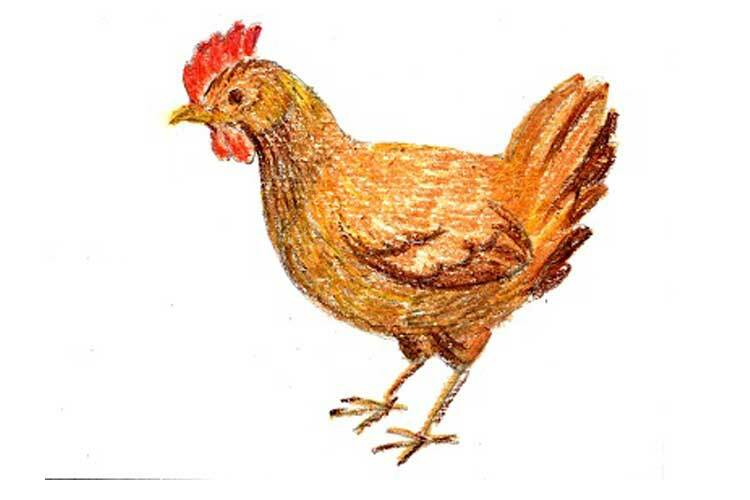 The tail of a hen consists of feathers; we draw each of them. Above the feathers are more significant, and becoming shorter downward. The contours of the body itself are also slightly editable, tracing the outlines of feathers along the edges. It is necessary to make the body of the chicken more pronounced. We also draw a wing on the side. 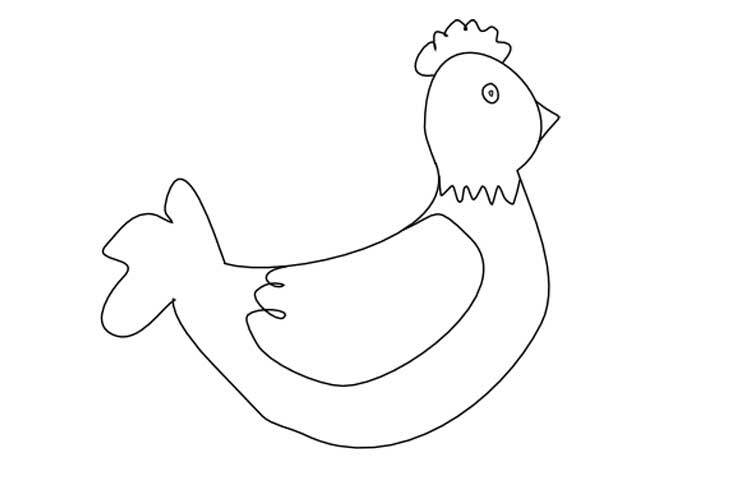 Outline the line of the head of a chicken, draws the legs. We erase the extra lines that we drew at the very beginning for the base. 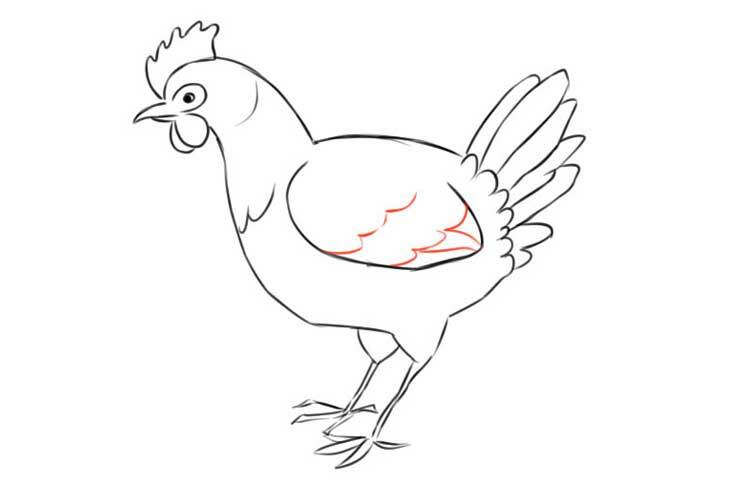 Add a few feathers on the wing of a draw chicken. It remains only to colour. 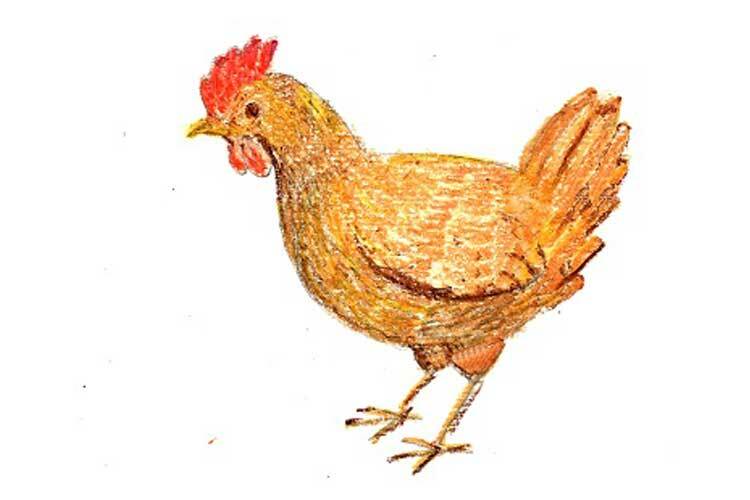 Hurray, this is a picture of a painted chicken! 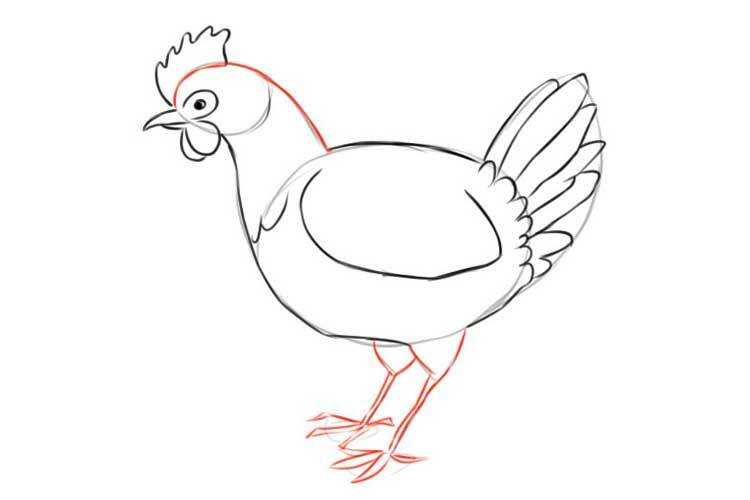 Try other bird drawing lessons from our website. 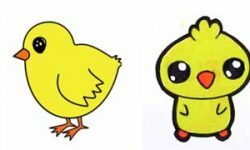 In this lesson, we will draw a chicken in stages. 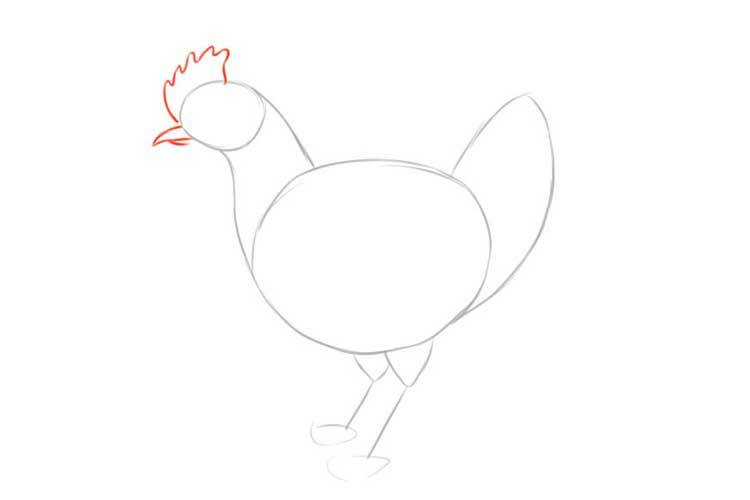 We start with the most critical stage, namely with the general shape of the body and head of the chicken. 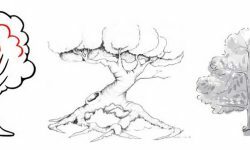 We draw a round head, and with a flourish, we are down – this will be the body. We draw a small eye. 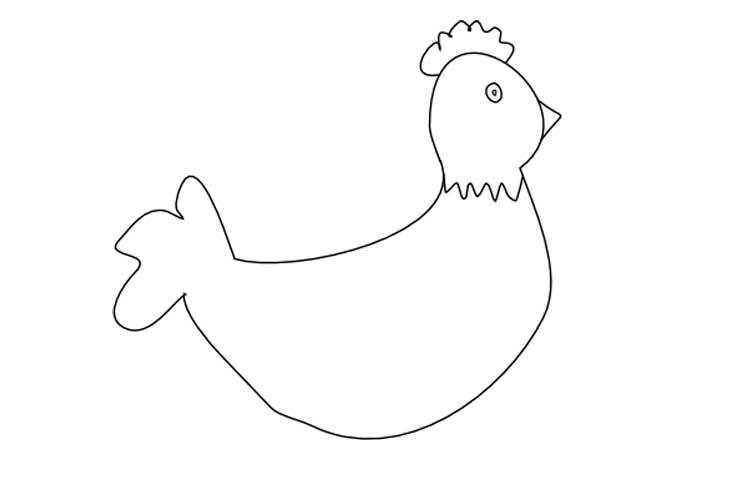 You can try to give the chicken a particular style and draw a big beautiful eye. 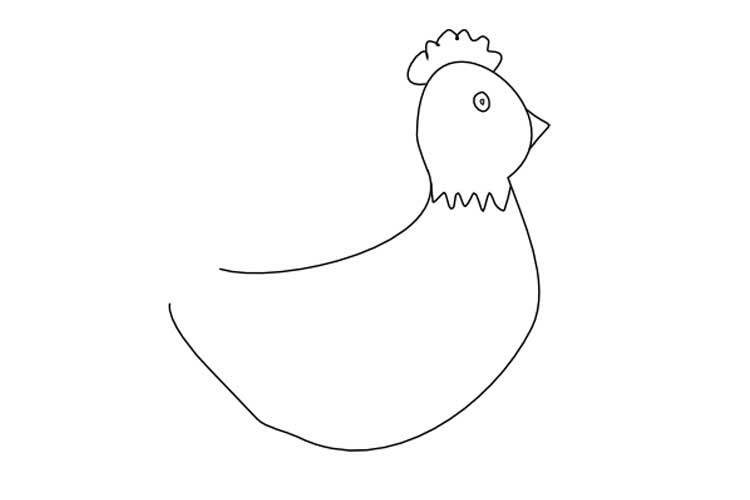 Draw a beak – a small triangle. 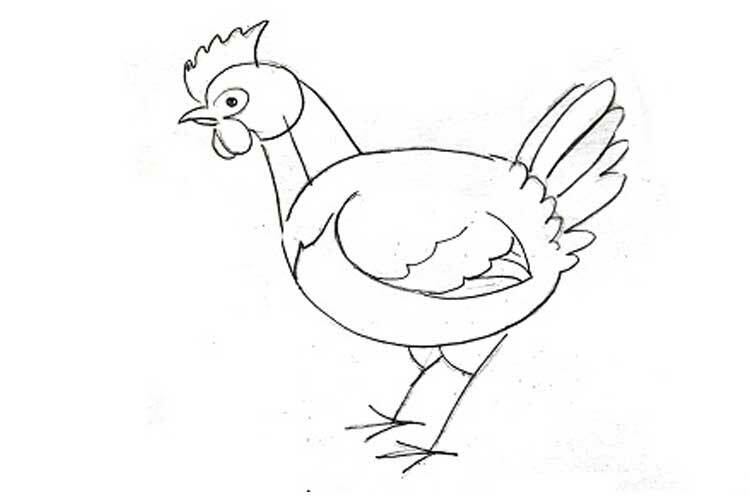 Draw the tuft and the plumage of the head of our chicken. Now wing. 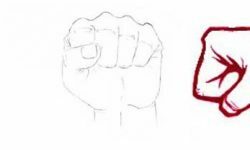 It should roughly repeat the shape of the body – it will be easier to draw. And there were chicken legs (legs). 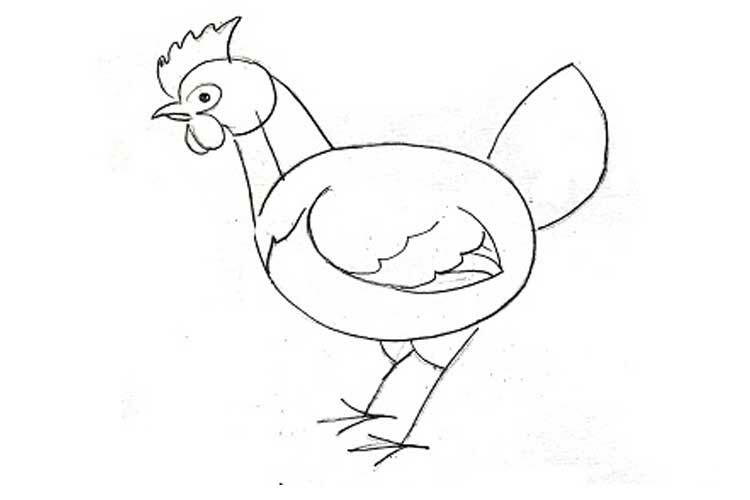 The image of the chicken is performed in stages. 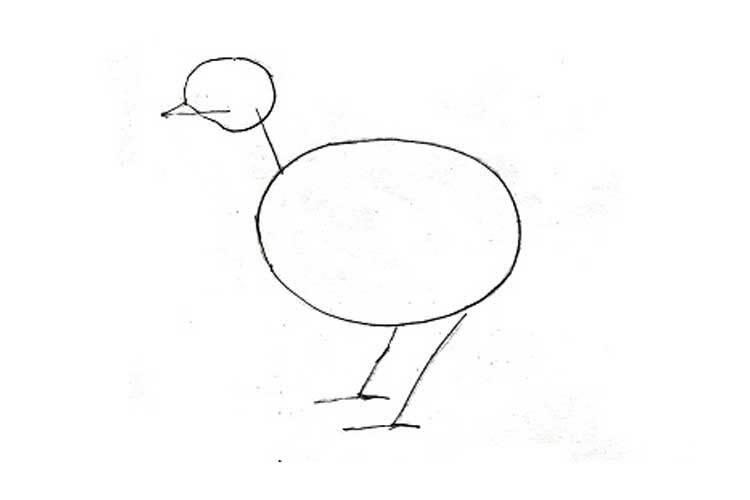 We start withdrawing the scheme on drawing paper, draw the details of the bird. Then we continue drawing with oil pastels. 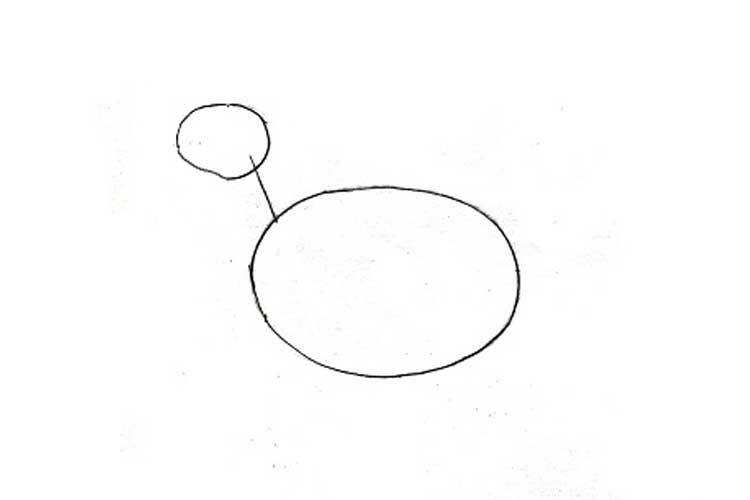 On a sheet of drawing paper in simple pencil draw two ovals. 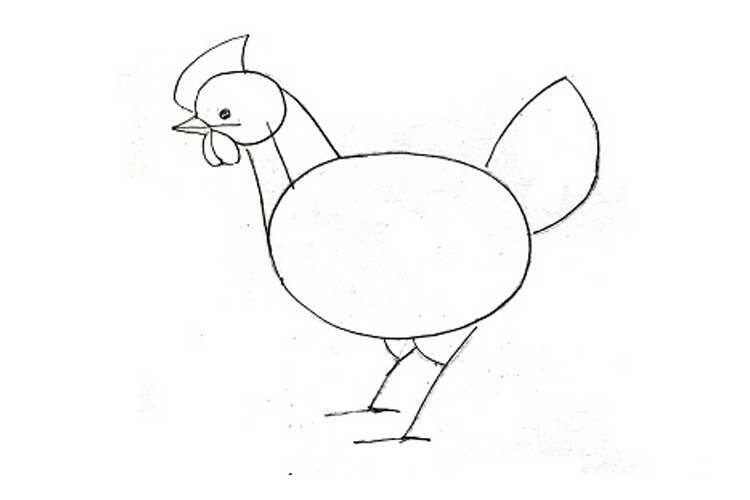 One oval is more – it will be a body, above it, an oval is smaller – it will be a chicken’s head. 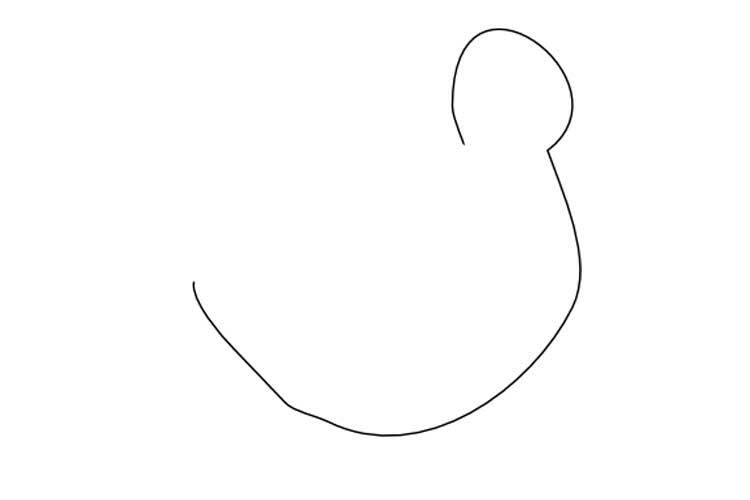 We connect a large and a small oval with a straight line – a neck. 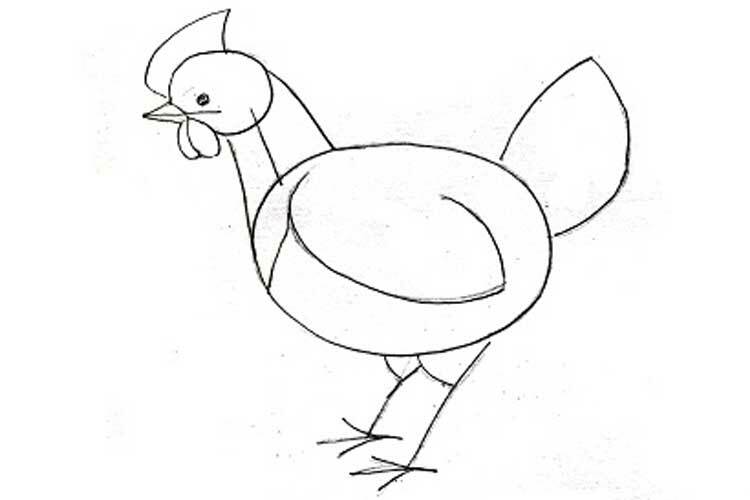 From the big oval down, we draw two lines with horizontal transverse segments below – the legs of the rooster. 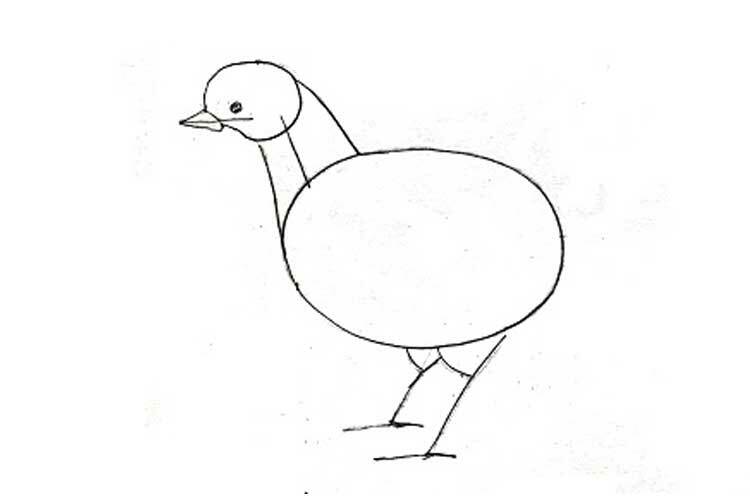 From the small oval on the left, pull the beak triangle. Add neck bending lines. Add triangles “pants” at the top of the legs. 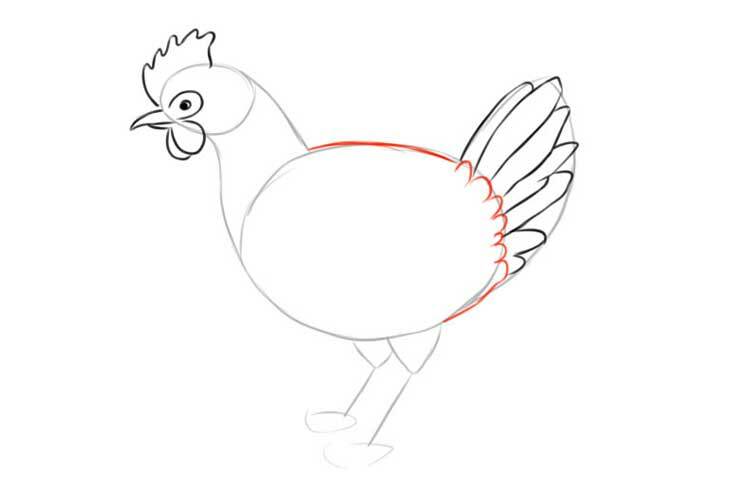 From the big oval to the right we outline the tail of the chicken. Above the head, oval mark the line of scallops. Under the beak, we place two semicircles of earrings. Inside the large oval, we outline the oval of the wing with a slightly pointed end. 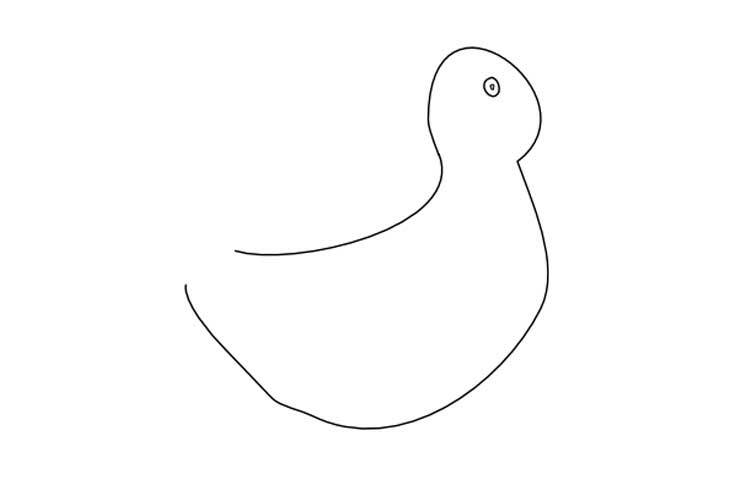 Draw smooth contours of the sharp beak, eyes and toothed comb. In the oval of the wing draw lines of plumage. 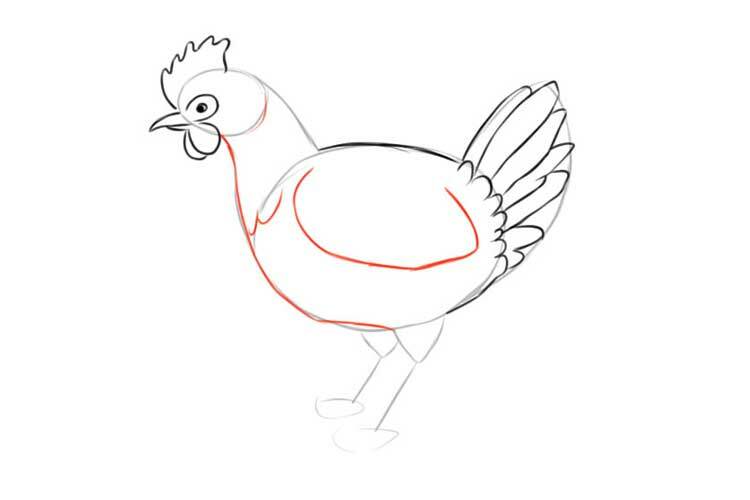 Add a pattern of feathers in the tail. 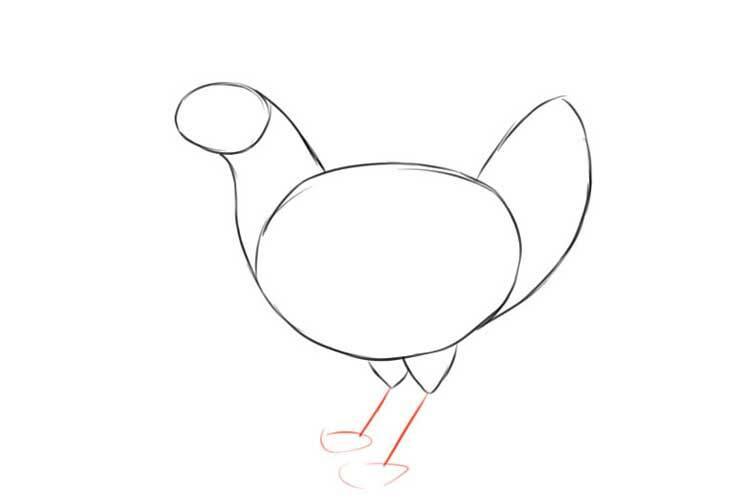 We draw the “pants” of the legs and paws with the sharp protrusion of the spurs and claws. Light strokes cover with small yellow plumage of the head, wing and tail. With red chalk, we shade the comb. 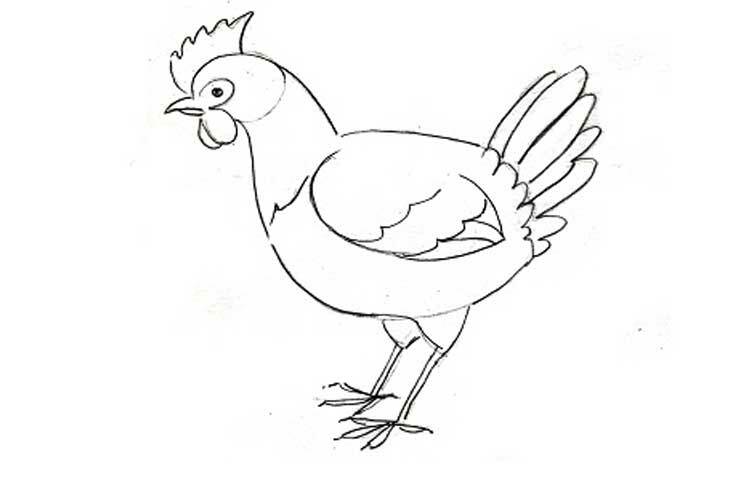 Light brown colour traces all parts of the chicken and feathers in the tail. Specify the tail and wing feathers dark brown chalk. 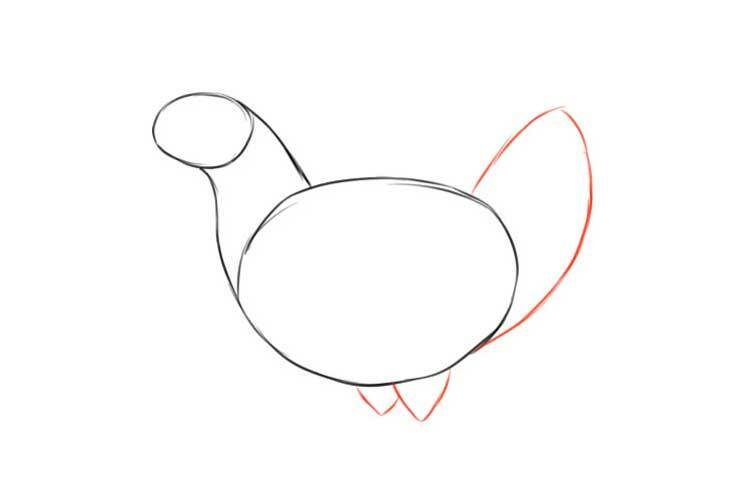 Draw the beak contour. Earrings and scallop pass red chalk. The figure is ready.